A flat surface like paper is a plane surface. When we get a curve by joining the number of points without lifting the pencil is a plane curve. It could be an open or closed curve. The simple closed curves which are made up of line segments only are called the Polygons. Polygons can be classified by the number of sides or vertices they have. Any line segment which connects the two non-consecutive vertices of a polygon is called Diagonal. The blue shaded part represents the interior and exterior of the closed curve. The polygons which have all the diagonals inside the figure are known as a Convex Polygon. The polygons which have some of its diagonals outside the figure also are known as a Concave Polygon. It’s all sides are equal. It’s all angles are equal. Hence square is a regular polygon but a rectangle is not as its angles are equal but sides are not equal. The sum of all the interior angles of a polygon remains the same according to the number of sides regardless of the shape of the polygon. Remark: This property is applicable to both convex and concave polygon. The sum of the exterior angles of any polygon will be 360°. This is used to find the number of sides in a regular polygon. This is applicable to irregular polygon also. The sum will remain the same whether it is a regular or irregular, small or large polygon. Any closed polygon with four sides, four angles and four vertices are known as Quadrilateral. It could be a regular or irregular polygon. 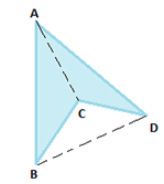 There are different types of the quadrilateral on the basis of their nature of sides and their angle. If a quadrilateral has one pair of parallel sides then it is a Trapezium. 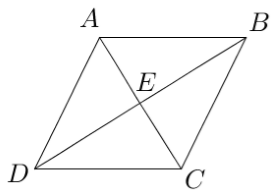 Here AD∥BC in quadrilateral ABCD, hence it is a trapezium. Remark: If the non-parallel sides of a trapezium are equal then it is called Isosceles Trapezium. 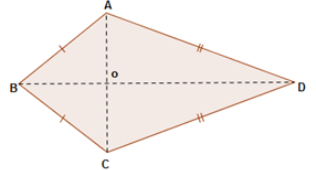 If the two pairs of adjacent sides are equal in a quadrilateral then it is called a Kite. The two diagonals are perpendicular to each other. One of the diagonal bisects the other one. If the two pairs of opposite sides are parallel in a quadrilateral then it is called a Parallelogram. 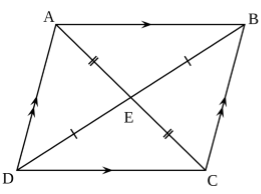 Here, AB ∥ DC and BC ∥ AD, hence ABCD is a parallelogram. 1. The opposite sides of a parallelogram will always be equal. 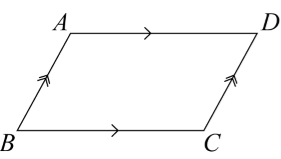 Here, AB = DC and AD = BC. 2. The opposite angles of a parallelogram will always be of equal measure. As in the above figure, ∠A = ∠C and ∠D = ∠B. 3. The two diagonals of a parallelogram bisect each other. 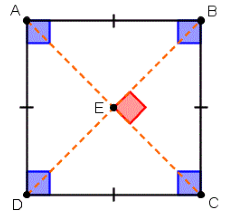 Here in ABCD, AC and BD bisect each other at point E. So that AE = EC and DE= EB. 4. The pair of adjacent angles in a parallelogram will always be a supplementary angle. If the opposite angles of a parallelogram are (3x + 5) ° and (61– x) °, then calculate all the four angles of the parallelogram. Now substitute the value of x in the given angles. Both the angles are 47° as the opposite angles are equal. Now to find the other angles let one of the adjacent angles to the above angle is z. 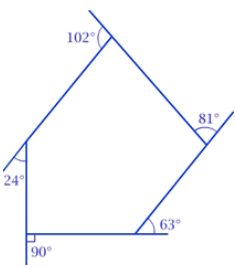 47° + z = 180° (adjacent angles are supplementary angles). The fourth angle will also be 133° as the opposite angles are equal. Hence the four angles of the given parallelogram are 47°, 47°, 133° and 133°. If a parallelogram has all the four sides equal then it is called a Rhombus. Here, AB = BC = CD = AD. A rhombus has all the properties of a parallelogram and a kite. The special property is that its diagonals are perpendicular bisector to each other. Hence, AE = EC and DE = EB. It makes an angle of 90° at the point of intersection of the diagonals. 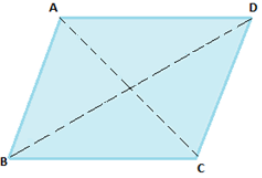 A parallelogram with equal angles and equal opposite sides is called Rectangle. Adjacent angles make a pair of supplementary angles. Diagonals are of equal length. All the four angles are of 90°. A rectangle with all the four equal sides is called a Square. All four sides are equal. Diagonals are perpendicular bisector to each other.